Bike-sharing services roll into the U.S.
WASHINGTON, DC—City commuters weary of stuffy journeys aboard buses and subways now have a better way to get to work, buy groceries and meet for a Saturday matinee. The bike-sharing programs that have transformed Europeans into two-wheeled travelers are now en route to the U.S.
Clear Channel Outdoor, an outdoor advertising company, will launch the country’s first bike-share service in Washington, D.C., in mid-May in partnership with the district’s Department of Transportation. SmartBike DC will initially offer annual subscribers access to 100 bikes at 10 stations in the city’s central business district. Other cities, including San Francisco and Chicago, are eager to follow suit. Bike sharing is a decades-old concept: offer urbanites and tourists low-cost access to bicycles within the inner city to ease traffic congestion, curb pollution and boost physical activity. Bike sharing, unlike renting, operates on a self-serve model (no attendants) and is geared toward short-term uses. But early bike-sharing efforts were marred by vandalism, high operating costs, and progressively tighter budgets that forced cities and advocacy groups to abandon their best intentions. New technologies, including GPS, RFID tags (radio-frequency identification) and automated payment kiosks have made systems more secure and user-friendly, but many cities still struggle to set aside funds to implement and support such services over the long term. Recently, private companies have stepped in, running bike-share services for a fee or in return for advertising rights on bus shelters and benches. Clear Channel has agreements under both models, says Martina Schmidt, president of Clear Channel Adshel, the company’s street-furniture division. The Washington, D.C., contract allows the company to provide advertising on up to 800 bus shelters. The company’s program in Barcelona is sponsored by the city. Public-private partnerships are common among existing bike-share programs, says Paul DeMaio, the founder of MetroBike LLC, a bike-share consultancy based in Washington, D.C.
Paris-based JCDecaux and Madrid-based Cemusa, in addition to Clear Channel Outdoor, are among the world’s leading street-furniture companies excelling in bike-share operations. All hope to bring their European experience to North America and are bidding on cities’ street furniture plans, which increasingly include a bike-share component. Clear Channel triumphed in San Francisco, but other cities, many of them yet to seek proposals, remain open. "Bike sharing is an interesting twist on public transit and very much matching the way people want to live today: They want to have their individuality. We see that in the way we consume music and video, and this is the same thing that is happening with public transit, " says Bernard Perisot, president and co-CEO of JC Decaux North America. 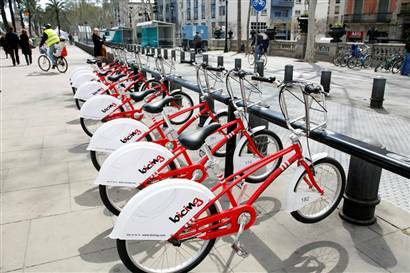 JC Decaux launched its bike-share service, Cyclocity, in 2003 in Vienna, Austria, and Cordoba and Gijon, Spain. But the company’s coup came with its Paris operation, Vélib’ , in 2007. Today, more than 20,000 bikes are available at over 1,400 stations, spaced 250 to 300 feet apart. "We have four times more bike-rental stations than subway stations, " says Parisot. The system is completely financed by advertising and rental charges.